With colder days ahead, it’s easy to bundle up in deeper, darker tones. But I’ve given myself a challenge. It’s to keep my favorite white denim pieces in fall-into-winter wardrobe rotation — only finished with a chunky sweater and booties. There’s something irresistibly refreshing, and even a touch luxe, about mixing shades from crisp white to cozy cream. And I for one am going to indulge! The sun actually disappeared as we shot this post, so if I could do it over I would definitely have added a white beanie and fur or puffer vest! 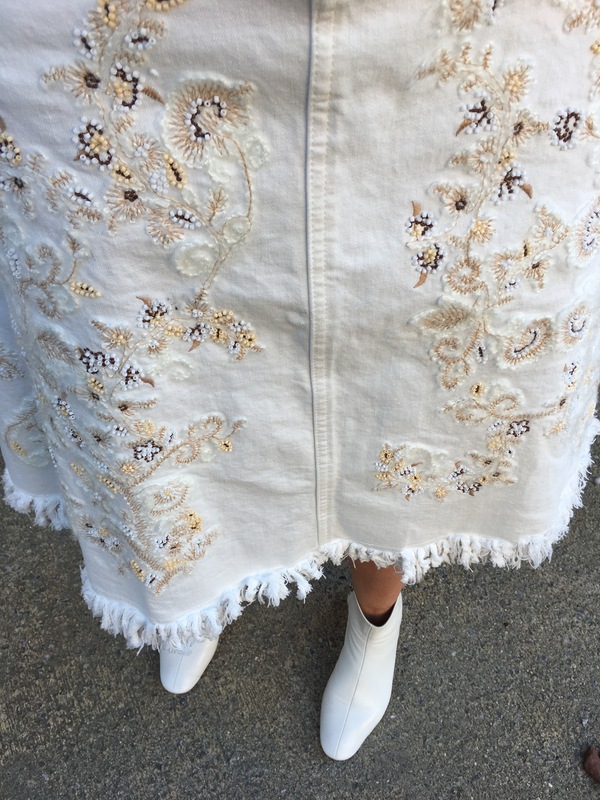 And as temps continue to dip, I’ll switch out this cream denim skirt for white jeans. 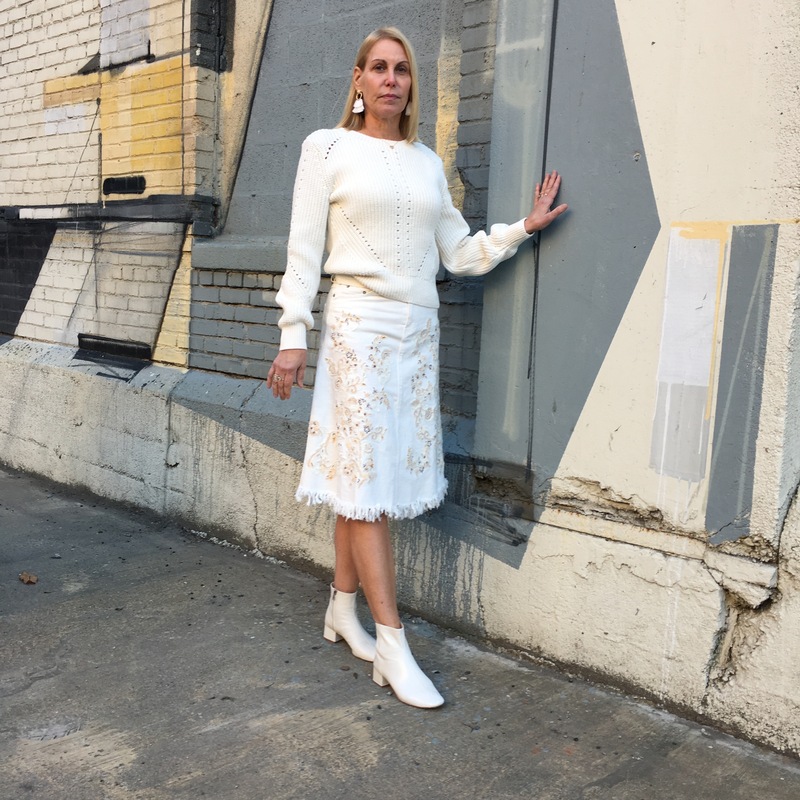 Hopefully you all won’t be too annoyed that both this chunky sweater and skirt were sale finds, so these exact options are no longer available in-store or online. But in creating the links below I’ve already loaded up more than one virtual shopping cart with some amazing alternatives. When you’re wearing a single color palette head-to-toe, it’s important to mix up your textures. My crewneck sweater goes beyond basic by pairing a classic cable knit with touches of open stitching. And this denim skirt! I simply love how it’s adorned with intricate beaded embroidery and finished with a frayed edge hem. In my book, it’s a showstopper. From this , this and this post, you already know how much these sleek white booties are a footwear favorite. And, of course, the obvious choice for completing this look. I can’t say enough about the quality of the leather and overall construction, plus a walkable block heel that’s the perfect height. 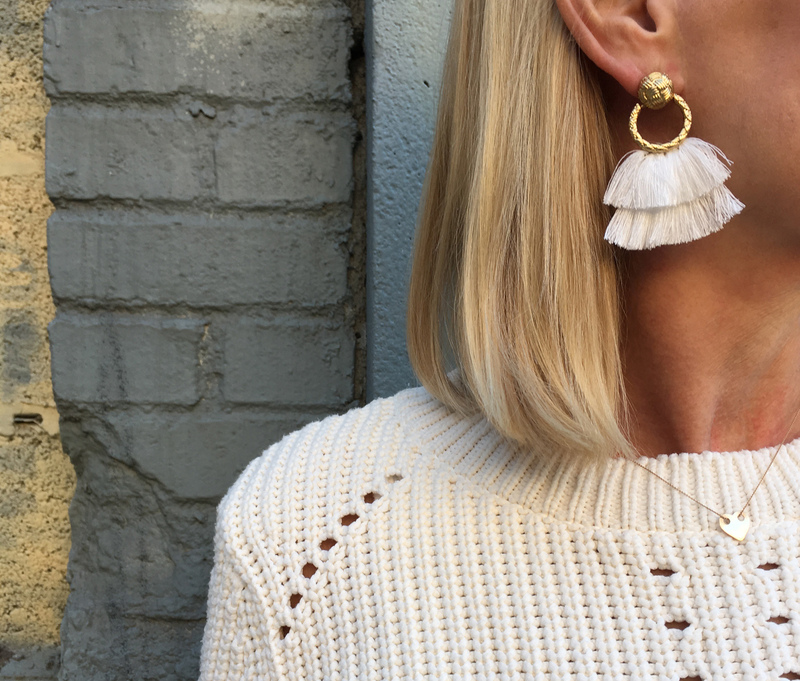 At the last minute, I added these fun, flirty fringe earrings (also seen here) because…because, why not? Sweater: (H&M, old) Want this (on sale), this and this (also on sale)! Skirt: (Zara, old) Some stunning new faves here (sold out but add yourself to the waitlist! ), here and here (30% off with code READYTOPARTY). Boots: (Loeffler Randall, also in 5 other colors!) Also really like these (affordable dupe), these (get your Western trend on for an amazing price!) and these. Earrings:(Love & Lemons, old) Fun, flirty alternatives here, here and here (all on sale!). Great post, your outfit is so cute! The pictures are gorgeous and I especially love those boots, so chic! Thank you, Jenifer. My photog (and dear friend) Kristin is so talented. And we always have a great time. She even gets me to smile! Love, Love, LOVE the boots!